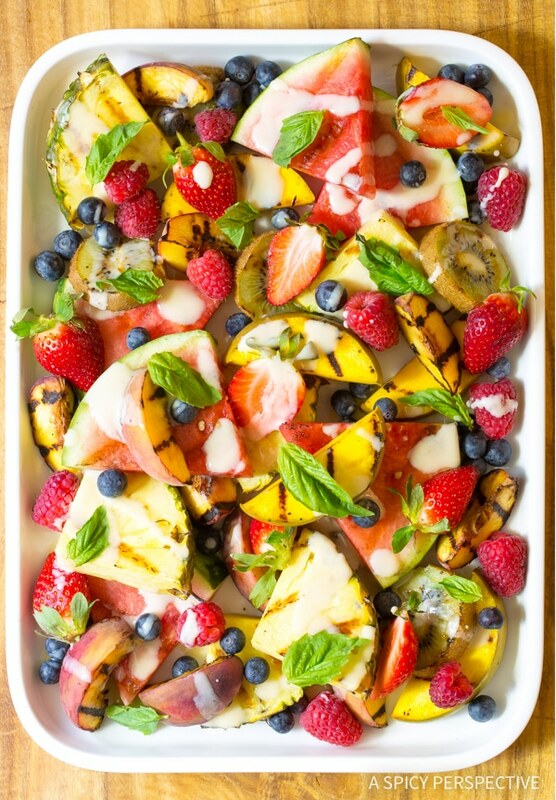 Perky Grilled Fruit Salad with Creamy Lime Dressing, a dazzling side dish for summer parties! Disclosure: This post is sponsored by ALDI. All opinions are our own. Check the link in post below and enter to win a $250 gift card to ALDI! Late spring and early summer parties are my favorite. Tropical beverages seem appropriate this time of year, so I get to mix tiki drinks to my heart’s content. 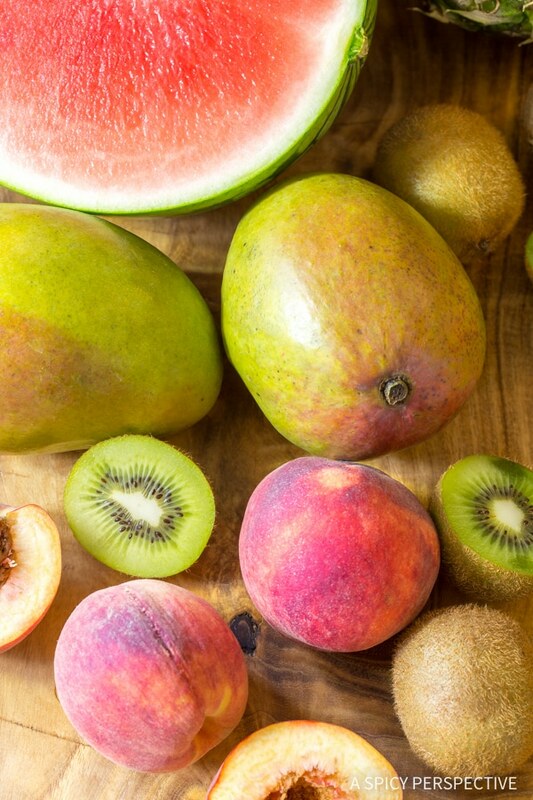 Best of all, fresh fruits are finally in season, making the menu light and lively! We are currently in the process of planning a party for later this month… Friends have been notified. The deck has been power-washed. And my menu is underway, focusing all foods that celebrate summer. 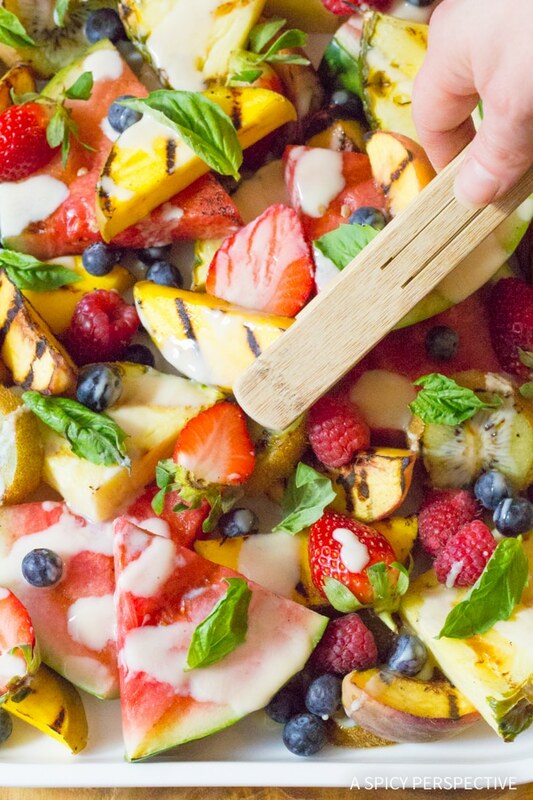 I plan to serve the Sheet Pan Low Country Broil I shared with you last week, along with pulled pork, potato salad, southern broccoli salad, homemade salsa, and this fresh and vibrant Grilled Fruit Salad with Creamy Lime Dressing. These menu items will allow me to cook some of my side dishes ahead, then have some fresh hot items I can whip up right before the party. Today’s Grilled Fruit Salad with Creamy Lime Dressing is a fabulous way to celebrate the season. 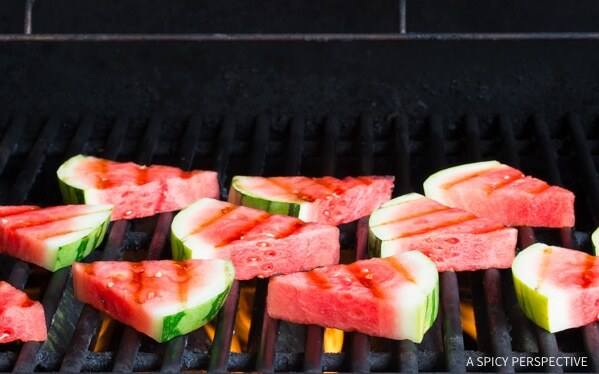 Grilling fresh ripe summer fruit, like watermelon, pineapple, mango and peaches, draws their natural sweetness to the surface for an intensified fruity essence. A creamy yogurt-based dressing with lime, honey, and vanilla accentuates all the fruity flavors. It also provides a warm-cool sensation when you taste the dressing on the grilled fruit. 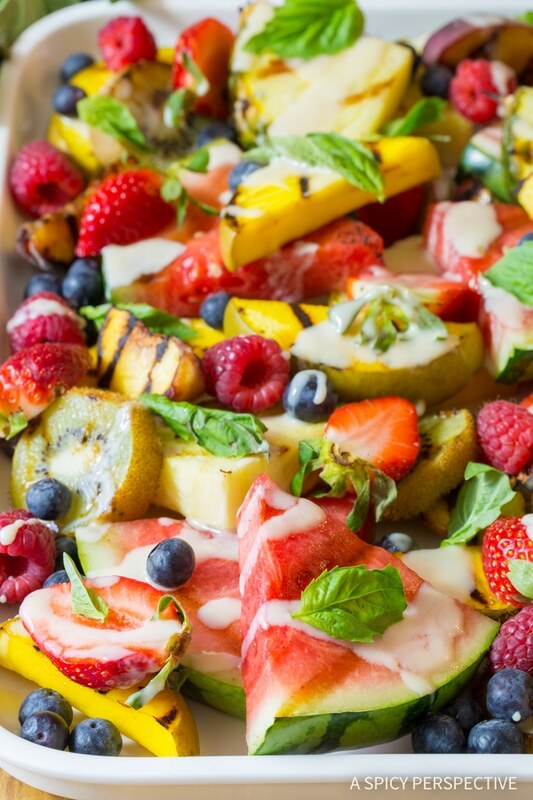 This Grilled Fruit Salad with Creamy Lime Dressing can be served as finger food or with utensils, and makes a wonderful addition to picnics and summer parties. Best of all, I found all this fresh summer fruit at ALDI! 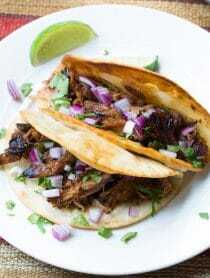 I saved a bundle on my entire party checklist, including the items for the Low Country Broil, the pork roast, and all the ingredients for the potato salad, broccoli slaw, and salsa. I have become a true ALDI convert. I’ll admit, the first time I ever visited ALDI, I didn’t get it. Bag my own groceries? Then a friend explained to me that every element of the ALDI shopping experience was designed to offer us the very best products at the lowest cost. From the quarter check-out carts to the layout of the shelving, ALDI makes it their goal to cut out unnecessary expenses and pass on the savings to their patrons. Once I understood the whys of the ALDI experience, it became my favorite place to shop. I can find higher quality foods… Organics, non-gmo items, and ingredients free of hormones, dyes, and preservatives, for much less than the conventional items at regular grocery chains. Every time I plan a party, ALDI is the first stop on my errand list. My son Carson even found an awesome old-fashioned popcorn machine there, he plans to use at our upcoming event. Check out weekly deals at ALDI to save even more for this season’s events! 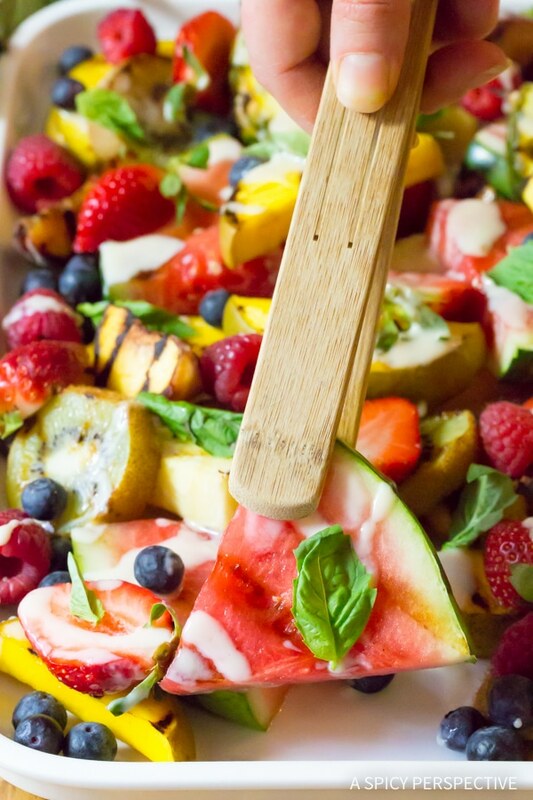 Grilled Fruit Salad with Creamy Lime Dressing Recipe, perfect for summer! This easy grilled fruit recipe is healthy and delicious. Plus, it's easy to make for parties! Preheat the grill to high heat. Cut the watermelon and pineapple into wedges, 3/4 inch thick. Cut the kiwi into 1 inch rounds. Cut each peach into 6 wedges and remove the pits. Halve the mango along side the pit, and cut each half into 3/4 inch pieces. Grill the cut fruit in batches, 1 minute per side. As you take the fruit off the grill, arrange it on a large platter. Sprinkle lightly with salt. Then sprinkle fresh strawberries, blueberries and raspberries over the top. 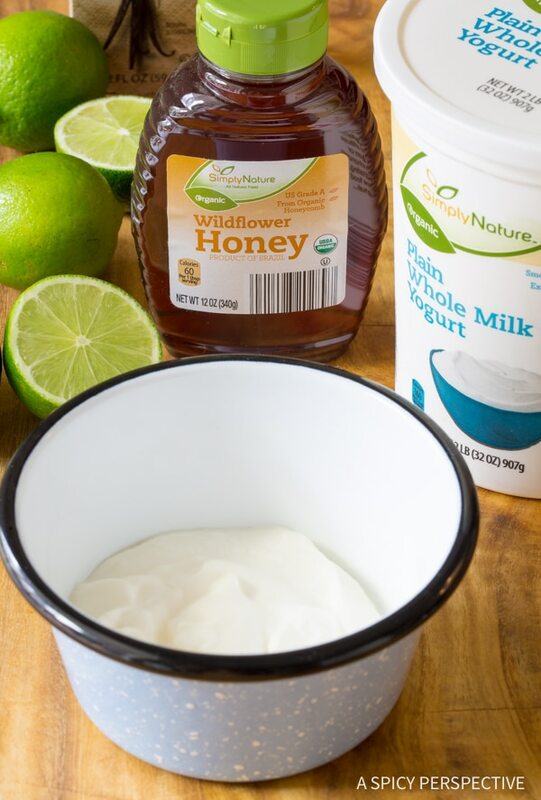 In a small bowl, whisk the yogurt, honey, lime juice, and vanilla together. 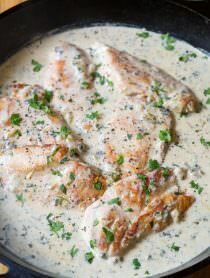 Drizzle the dressing over the top and sprinkle with fresh basil leaves. NOTES: All name brand ingredients listed in the recipe were found at ALDI. i drive an hour away (most of the time in traffic) to shop at aldi. Granted its only a few times a year but i make sure to stock up as much as i can, i just love their prices and selection. I always know i can find the freshest produce at Aldi’s! I aldo love their prices. They just built a new Aldi store close to me and it has to be the best store I ever shopped at. All the best deals..
That salad is so beautiful! I like Aldi’s because they have such a great selection of produce. I also like their bulk items — I always find just what I need at Aldi’s! My experiences with ALDI have always been positive! They have good customer service, good prices and a lot of great organic items which I love! I love Aldi I shop there all the time you can’t beat the bargains or the variety. I love fruit salads and a grilled one looks delicious! An ALDI opened by me but I haven’t gotten over there yet. i LOVE aldi!! always my go to!! Aldi is super budget friendly and saves me a lot of money. They’re my go-to for spices, canned goods, staples, and cool seasonal items. 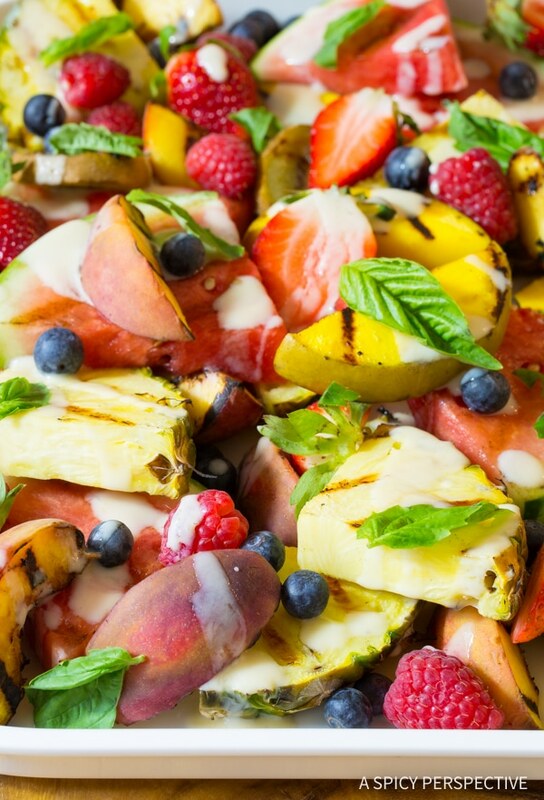 I’ve never thought of doing a grilled fruit salad, it looks great! My husband and I had our first experience with Aldi in Ireland, and were pleasantly surprised at the high quality of produce, local cheeses, pasture-raised local meats, and even beer/wine available on offer, all for extremely reasonable prices! We sadly do not have a store near us back in the States, but make a visit whenever we’re travelling. Never been there but this sounds great! GORGEOUS salad ~ I need to locate an Aldis ~ are they in Los Angeles? I love aldi’s. Their prices are better than walmart which was my primary spot until our new aldis by our house opened. Their fruit is cheap but so delicious! I love going there for any type of food. I’m lucky enough to live within a couple miles of a Aldi store. I love their Special Buys and have found many great deals there from garden items to kitchen utensils. I always get some good chocolate there. My mom came with me the last time I went and bought an apple pie. She said it was delicious! Now we both shop there. Aldi is the best! My husband and I are always sharing the Aldi love with friends and family. It’s been hugely important in our quest to become debt free. 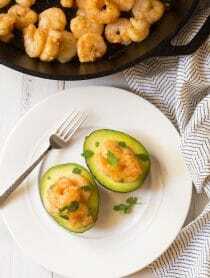 We can still eat delicious, good quality food while saving money. Fruit salads are great for Summer months. There is an Aldi’s store not too far from my house. My husband and I are going there to shop later this week. Looks like a winning recipe! Do you serve grilled fruit warm or cold? I love Aldi’s! We have one in our area that is being remodeled. Their produce & meats are excellent quality. I love the fact that they’ve moved towards more healthy foods. The prices allow you to get more bang for your buck. In addition, they always have great buys on seasonal department store items! Can’t wait to try out this grilled fruit recipe, also! I haven’t shopped at Aldi yet. The stores have just come to my area. I’ve never grilled fruit and just bought a pineapple to try. It looks delicious! Love aldi. It. Has amazing prices and is great quality. I love shopping there and am glad we live close to one again. I love fruit salads – any kind and this latest one grilled really appeals to me.